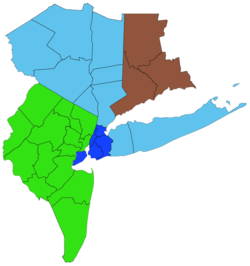 For decades, the Regional Plan Association (RPA) has played a vital role in shaping the growth of the New York metropolitan area, addressing the interrelated challenges of transportation, development, sustainability, infrastructure, and land use. The professionals enlisted by RPA are among the most highly-respected in the world, and their efforts have a significant impact on public decision-making. This past week, New Rochelle’s Development Commissioner and I attended the annual RPA Assembly in Manhattan, where we heard from Mayor De Blasio and Connecticut Senator Chris Murphy, and where I helped moderate a discussion about regional governance. The highlight of the event was a sneak peek at RPA’s Fourth Regional Plan, still in its early stages of development. An introductory video and a report entitled “Fragile Success” provided a clear illustration of the challenges and opportunities confronting the New York area, and we also got a taste of the interactive tools that will help guide the evolving document. This is important stuff. Getting it right will mean a healthier economy, a better quality of life, and affordable costs. Getting it wrong . . . well, we’d better not get it wrong. And this regional context has obvious implications for our choices here in New Rochelle and Westchester.